Adrian Arturo Sanchez...Resides in Barranquilla, Colombia with his wife, Dariela and daughter, Sara. Was first recalled on April 24 and eventually enjoyed four stints in D.C...Went 14-for-45 (.311) with two doubles, one triple, three RBI, one walk and seven runs scored in 13 Major League starts...Made appearances at second base (13 G) and third base (7 G)... Recorded a season-high three hits going 3-for-4 with two runs scored on Sept. 26 vs. Miami...Hit .246 with 17 doubles, three triples, five homers, 31 RBI, 17 walks, 12 stolen bases and 28 runs scored in 75 games between Triple-A Syracuse and the GCL Nationals...His 31 RBI were his most in a Minor League season since 2014...His five home runs matched a career-high. Appeared in 77 games between Double-A Harrisburg and Triple-A Syracuse, hitting .245 with 15 doubles, one triple, five homers, 21 RBI, 20 walks and 41 runs scored...Five home runs were a career high...Had his contract selected on June 30 and eventually enjoyed two stints in D.C...Made his MLB debut on June 30 at STL (Def. Replacement)...Made his first start on July 3 vs. NYM...Recorded his first MLB hit and scored the game-winning run, July 7 vs. ATL...Hit 12-for-39 (.308) with six doubles and nine RBI in his final 11 MLB starts...Played stellar defense, appearing at second base (10 G), shortstop (8 G), and third base (7 G)...Went 8-for-16 (.500) with three doubles, 10 RBI and one walk with runners in scoring position. Advanced to Triple-A Syracuse for the first time in his career...Played in 111 games, his most since 2014. Hit .280 with 16 doubles, one triple, three homers, 22 RBI and 34 runs scored in 82 games for Double-A Harrisburg, Single-A Potomac and the GCL Nationals. Advanced to Double-A Harrisburg for the first time after beginning the season with Single-A Potomac. Spent the entire season with Single-A Potomac, his second full season in the Carolina League. Advanced to Single-A Potomac for the first time in his career...Spent the entire season with the P-Nats. Played in a career-high 131, setting career marks in nearly every offensive category...Many of those marks still stand entering 2018. Began the season with the GCL Nationals before joining Single-A Hagerstown...Hit .350 with 11 doubles, four homers, 36 RBI and 38 runs scored in 54 games between the two stops. Played 24 games in his first domestic season with the GCL Nationals. Played his second professional season with the Dominican Summer League Nationals. Debuted for the Dominican Summer League Nationals. 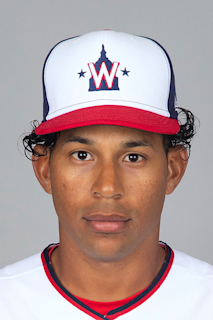 April 7, 2019 Washington Nationals optioned SS Adrian Sanchez to Harrisburg Senators. April 3, 2019 Washington Nationals recalled SS Adrian Sanchez from Fresno Grizzlies. March 26, 2019 Washington Nationals optioned SS Adrian Sanchez to Fresno Grizzlies. September 4, 2018 Washington Nationals recalled Adrian Sanchez from Syracuse Chiefs. August 22, 2018 Washington Nationals optioned SS Adrian Sanchez to Syracuse Chiefs. August 21, 2018 Washington Nationals recalled Adrian Sanchez from Syracuse Chiefs. August 12, 2018 Syracuse Chiefs activated SS Adrian Sanchez from the 7-day disabled list. August 6, 2018 Syracuse Chiefs sent 2B Adrian Sanchez on a rehab assignment to GCL Nationals. July 16, 2018 Syracuse Chiefs placed SS Adrian Sanchez on the 7-day disabled list. June 12, 2018 Washington Nationals optioned SS Adrian Sanchez to Syracuse Chiefs. May 19, 2018 Washington Nationals recalled Adrian Sanchez from Syracuse Chiefs. May 5, 2018 Washington Nationals optioned SS Adrian Sanchez to Syracuse Chiefs. April 24, 2018 Washington Nationals recalled Adrian Sanchez from Syracuse Chiefs. March 26, 2018 Washington Nationals optioned SS Adrian Sanchez to Syracuse Chiefs. October 13, 2017 Adrian Sanchez roster status changed by Washington Nationals. October 6, 2017 Washington Nationals reassigned SS Adrian Sanchez to the minor leagues. September 8, 2017 Washington Nationals recalled SS Adrian Sanchez from Syracuse Chiefs. August 29, 2017 Washington Nationals optioned SS Adrian Sanchez to Syracuse Chiefs. June 30, 2017 Washington Nationals selected the contract of Adrian Sanchez from Syracuse Chiefs. April 13, 2017 3B Adrian Sanchez assigned to Syracuse Chiefs from Harrisburg Senators. March 3, 2017 2B Adrian Sanchez assigned to Washington Nationals. September 25, 2016 3B Adrian Sanchez assigned to Aguilas del Zulia. July 8, 2016 3B Adrian Sanchez assigned to Syracuse Chiefs from Harrisburg Senators. February 12, 2016 3B Adrian Sanchez assigned to Harrisburg Senators. November 21, 2015 Washington Nationals signed free agent 3B Adrian Sanchez to a minor league contract. November 6, 2015 3B Adrian Sanchez elected free agency. August 4, 2015 Harrisburg Senators activated 3B Adrian Sanchez from the 7-day disabled list. July 29, 2015 Harrisburg Senators sent 3B Adrian Sanchez on a rehab assignment to GCL Nationals. July 16, 2015 Harrisburg Senators placed 3B Adrian Sanchez on the 7-day disabled list. July 9, 2015 3B Adrian Sanchez assigned to Harrisburg Senators from Potomac Nationals. June 15, 2015 3B Adrian Sanchez assigned to Potomac Nationals from Harrisburg Senators. May 19, 2015 Harrisburg Senators activated 3B Adrian Sanchez from the 7-day disabled list. April 24, 2015 Harrisburg Senators placed 3B Adrian Sanchez on the 7-day disabled list. March 30, 2015 SS Adrian Sanchez assigned to Washington Nationals. October 9, 2014 2B Adrian Sanchez assigned to Aguilas del Zulia. May 12, 2014 3B Adrian Sanchez assigned to Harrisburg Senators from Potomac Nationals. March 23, 2014 2B Adrian Sanchez assigned to Washington Nationals. February 25, 2013 2B Adrian Sanchez assigned to Washington Nationals. May 5, 2012 Potomac Nationals activated 2B Adrian Sanchez from the 7-day disabled list. April 24, 2012 Potomac Nationals placed 2B Adrian Sanchez on the 7-day disabled list. March 24, 2012 2B Adrian Sanchez assigned to Washington Nationals. October 11, 2011 2B Adrian Sanchez assigned to Aguilas del Zulia. August 4, 2010 Adrian Sanchez assigned to Hagerstown Suns from GCL Nationals. May 29, 2009 Adrian Sanchez assigned to GCL Nationals from DSL Nationals. January 21, 2007 Washington Nationals signed free agent 2B Adrian Sanchez to a minor league contract.